N Chandrababu Naidu is going to receive another prestigious International award. 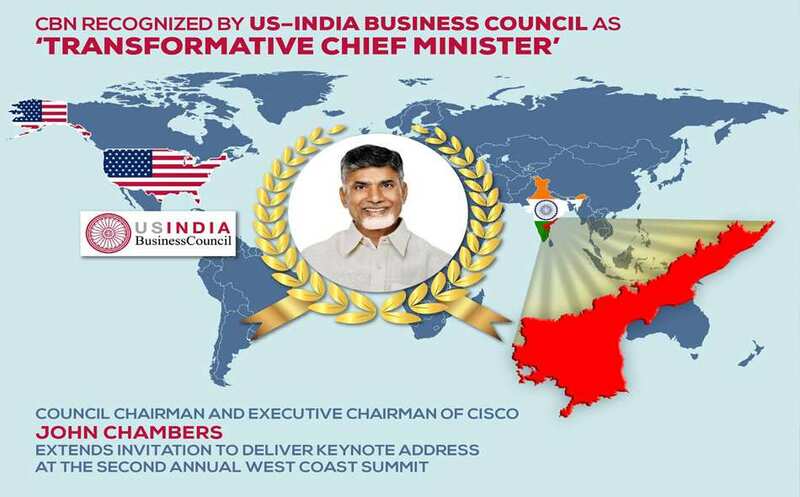 The United States-India Business Council (USI BC) has declared him the "Transformative Chief Minister" in India. The award will be presented to him at the Second Annual West Coast Summit in California on May 8. The United States India Business Council has requested Chief Minister N Chandrababu Naidu to deliver the keynote address at the Summit. Menlo Park of California is getting ready to host the summit, which is going to be on the various aspects of financial Services, clean fuel, Securing health and other industry related topics. Former Secretary of State Dr Condoleezza Rice, Fintech, and IoT industrialists among others would attend the summit. Secretary for Electronics and IT Department Sundara Rajan Will also be given an award for his "Transformative Leadership' at the summit.